It is always difficult to crystallise the image of someone, particularly a person as well known as Giorgio Armani, one of the most famous figures in the world. It is not a coincidence that Andy Warhol portrayed him as a one of the icons of our age. 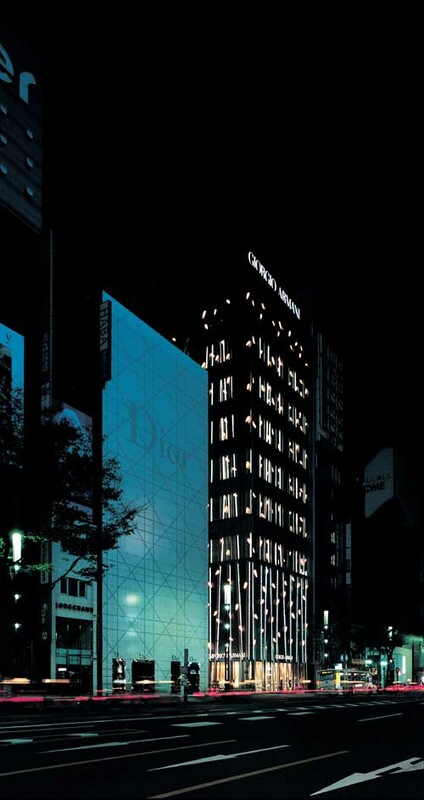 For the Armani/Ginza Tower, it was considered essential to project not just his creativity as a designer but his special aura, recreating the atmosphere of the atelier of this Italian creative genius, as well as his aesthetic code and his personal image. How to translate these qualities into architecture? How to combine the concept of luxury with restrained elegance, the concept of absolute modernity with a lasting style… the Armani style? It is in Tokyo that for the first time ever the entirety of his output is to be displayed within the same building. Tokyo, a city alive with continuous movement. The brightly lit buildings pulsate with the vibrant speed of the traffic all around them, creating through a ceaseless flux of brilliant images the expression of a metropolitan spirit. The irresistible appeal of the big oriental capital cities consists in the rapidity and speed of their endless transformations. These are cities that pulsate like living organisms, continually modified to adapt to the needs of new inhabitants. They represent the polar opposite to our own European cities, so dark, secret and suffocated by history. How to translate the concept of his featherweight clothes, the delicacy and the craftsmanship of his embroidery, the sensuality of the interplay between body and fabric? His vision and relentless research into materials, together with his use of delicate, translucent and radiant colours are key factors that prompted this consideration. We explored a host of ideas, we experimented with new textures, modelled, sculpted, emptied, dematerialised spaces using light, the evanescence of an intimate sensation that is, however, born in from the exterior. We have sought to reveal the world of Armani through a range of screens, as light as gossamer and as precious as silk. The sophisticated image of the Giorgio Armani brand rich in translucence and intimacy is juxtaposed with the immediacy and modernity of the spaces dedicated to Emporio, identified by more expansive areas in which shafts of white light cut through and are reflected within the setting. But the most important aspect that we wanted to incorporate along the internal pathway between the zones is the element of surprise. To seek to incite emotion is as much the remit of the architect as it is of the designer. Working with the designer has been an unusual assignment for us, usually it is the building, the external architecture that takes precedence over the content. 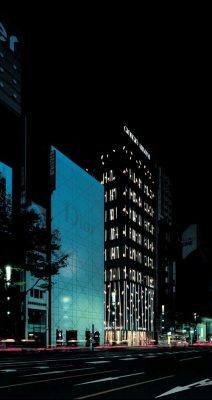 For the Ginza project the opposite has been true: the exterior is a glass tower, totally merging into the Ginza skyline, its glass surface mirroring and relaying reflections of the sky and the surrounding buildings, full of different lights and colours throughout both day and night. The permeability of the surface is toned down by a cascade of brightly lit leaves that delicately float down the facades and, according to the time of day or the season, are modified in intensity and colour. This has been like working under a microscope, examining every tiny little detail, trying to find the ultimate solution. Contrary to most other projects where the client is rarely encountered, Giorgio Armani has been deeply involved, always ready to engage with every little adaptation of the concept.